Today in Tehran, Iran. This rally was officially banned by the government. Could this be the beginning of the Second Iranian Revolution? 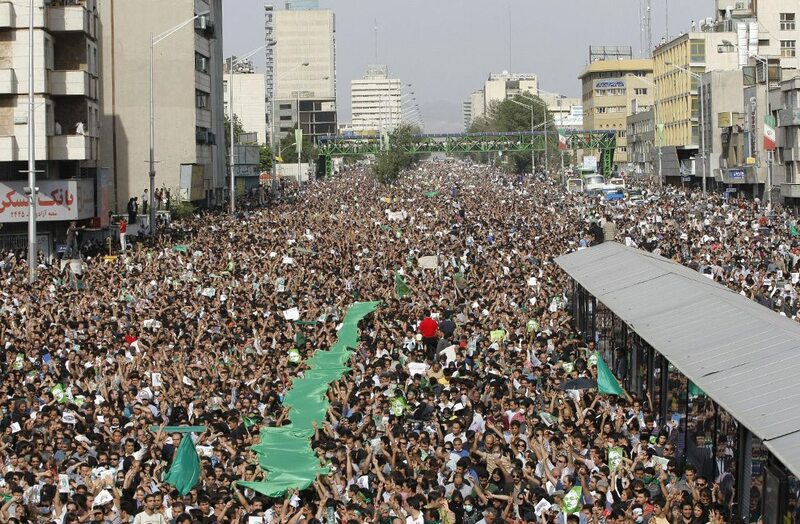 Today, Monday, June 15th – 100,000, 200,000 or perhaps 1 million people mobilized in the streets of Tehran, the capital, in a show of support for the reformist candidate, Mir Hossein Mousavi, who allegedly lost the recent election for president. 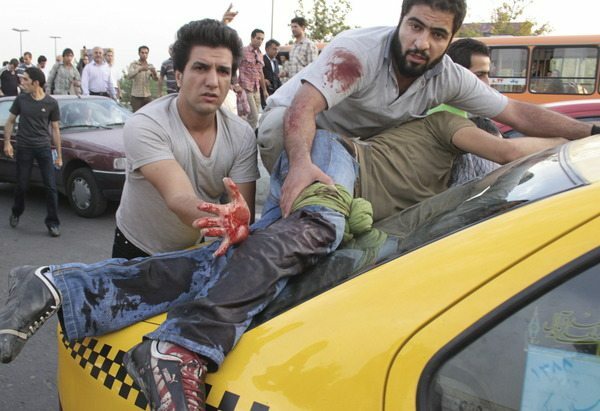 As nightfall began to fall in Iran, reports of gunfire were made coming from government-linked militias, and at least one confirmed demonstrator was shot to death, others wounded. One of the wounded from today's massive rally. Government aligned militias opened fire on segments of the crowd. For more information, check into these links: go here, here, and here, and here. With all eyes on Iran and the government clamping down on the international and local media, the web has become a major source of information for the fast-moving story. From Tweets from the streets of Tehran to blogs rounding up the best commentary, below is a series of links on the latest news. Twitter is a source for quick updates on fast-moving events and eyewitness observations. However, anonymous Tweets can also lead to rumor, so they should be read with caution. The latest tweets on the election aftermath can be found if you type in #iranelection into the Twitter search box. Twitter also has an aggregated list of Iran links on an Iran Unrest twazzup page. Tweetscan is another source for the latest tweets. The latest photos are being posted on twitpic. Several posters with frequent tweets with on the ground updates including: persiankiwi, TimObrienNYT, and mousavi1388. From amateur cell phone video to BBC reports, YouTube is a source of some great video. If you type “Iran protests” into YouTube’s search box, thousands of videos will appear. Click here to see video of a large protest in Tehran on Monday. A user has compiled a good list of links here. In addition to the msnbc.com’s slideshow on the aftermath of the election, more still photos can be found at tehran 24, twitpic, flickr and picasso. Some news, but more opinion, about the latest from Iran is being shared on Facebook. Some popular topic pages are: I-heart-Iran and Where’s my vote? Sadly, this is just a baby step towards a new start for the Iranian people. It’s likely that, in this instance, the government, with all the resources it commands, will prevail. It will be very easy for the legitimate aspirations of the Iranians to be coopted by any or all of these forces. Two very important things happened today in Iran: one, Iran’s supreme leader Ayatollah Ali Khamenei called for an official inquiry into accusations of election irregularities, and two, several hundreds of thousands massed in the streets and squares of Tehran, the capital, to show support for the reform candidate, Mir Hossein Mousavi, even though it was banned by the government. The more people the government shoots, kills, and beats, the stiffer the resistance. The young of Iran did not experience the first Iranian revolution of 1979 that kicked out the Shah, America’s ally. Mousavi is calling for continued protest, a general strike for tomorrow – Tuesday. Another large rally is also planned. I’m not as pessimistic as Mr fresh. It is a sad day when people get shot down, like today, but this is much more than ‘a baby step’ – when the largest crowds in 30 years appear poised to resist the government. It is true, perhaps the religious leader is stalling for time, but this is far from over. Anyone else notice how many of the “voices” in the US are now so sympathetic with the demonstrators? Many of these talking heads are the same right-wingers who just weeks ago were advocating bombing them. THANK YOU for saying what needed to be said. These are the types of people who, when gas prices dropped down to below $2, went and got a brand new SUV. I cannot imagine living life on such a short-sighted cycle. This is going to be very interesting to follow. The Iranian youth are embarrassed by their present government and are doing something about it. It’s good to see huge crowds in the streets of a country whose government has lost touch with the people. The Persians have historically been a strong and savvy people and the youth want to be proud of their country again. I don’t think they will ever be the puppets of the United States as they were under the Shah. They have the potential to be a strong member of the international community if they have leaders who can lead without all the vitriol and hysteria that the present leadership is spouting. Chances are that the will not prevail this time around but the next election will be very interesting. Does anybody else see parallels between this election and the campaign between Bush & Al Gore? Gary – thinking about the Gore v Bush election all the time. Where were we? not in the streets, that’s for sure. Even jettyboy. We just sat by our tubes, in shock and wonderment. I later vowed I would never do that again – sit silently while our election goes down the drain. These brave Iranians, like the Chinese youth and workers in 1989, like the brave Polish Solidarity folks in 1980, like people in Paris in 1968, and may I dare say it? Like the brave young Americans in Spring 1970 (sorry Gregg).